A perennial pop underachiever and a sleeping giant of the game square up in this intriguing Group C clash. Click below the cut for managerial comment, analysis, match reports and previews. HOW TO VOTE: Pick the track you like best and vote below. This poll will be up until sometime on April 7th. Holland v Italy: Which track do you prefer? I read MOAR comics and summarise them so that you, the layperson, can taste some of the thrilling world of “mainstream comics”. As before, this contains many, many spoilers. A couple of weeks ago I found myself transfixed by a Youtube video of Westlife singing their new single, surrounded by swirling ice skaters and talented lighting technicians. It was wonderful. As I hit the ‘blog this right now’ button, I wondered if – at 26 years old – I’d finally sealed my fate of becoming a Mum. Not biologically of course (*shudder*), but in my musical tastes. Is Mum-pop really my inescapable destiny? Something that became miserably clear to me last week: Marks & Spencers have brutally culled their sandwich range – goodbye most of the black-label “food to go” range which brought us the Steak & Blacksticks Blue sandwich (probably the nicest EVER CREATED by a British supermarket chain) among others. The black-labels have been replaced by an odd range of tortillas, kinda-sorta-open sandwiches and things which look like someone’s started making a wrap and wandered off before the actual wrapping happens. All these new things cost a lot and have visibly less filling – not surprising given the cost squeeze on food suppliers as prices rise. There’s been another subtle change in the sandwich range though: everything possible is now branded “British”. 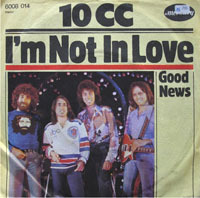 “I’m Not In Love” is 10cc’s most famous song, and surely deservedly – it’s the one where their smarts crash and fragment on some vicious emotional reefs, which is also what the song’s about. So it’s a neat (conceptual) package even before you factor in the extraordinary production. But isn’t it all a bit heavy handed? What with one thing and another I’ve rather fallen behind in my comic reading, so I took the opportunity recently to catch up on a bunch of Marvel and DC stuff, reading a year or so’s worth at a time. Here’s what I thought – naturally with plenty of spoilers as this post is designed to give people who don’t read comics an idea of what they are missing. Methinks Jacobs Creek are missing a trick here – come on guys – “Ticket To Wine” is up for grabs! Our first Group C match features a giant of the European pop game up against a relative newcomer. Play or download the songs right here and click below the cut for polls, managerial comment, analysis and previews! Sort of a cheat this, but if you’re going to cheat, that’s the title I want to cheat with. This is not just a cover of a French Agatha Christie novel whose title has been changed a few times in the English. It is the cover of a Bande Dessinée adaptation. Nice 3D name logo which contrasts nicely with the deliberately 2D artwork on the cover. You get the feel of the artwork and the mysterious house aspect of one of Agatha’s most (in) famous mysteries.